The sharing economy, also known as the access economy, peer-to-peer (P2P) economy, or collaborative economy is a mode of consumption whereby goods and services are not owned by a single user, but rather only temporarily accessed by members of a network and underutilized assets are shared, either for free or for a fee. It includes "sharing, bartering, lending, trading, renting, gifting, and swapping redefined through technology and peer communities." Other examples include: exchanging, collective purchasing, shared ownership, shared value, borrowing, and subscription based models. It is based on the idea that having access to a good or a service can be preferable to having ownership of such good or service and that there are benefits to collaboration in ownership. It refers to a hybrid market model of peer-to-peer exchange. The sharing economy has grown with information technology and is now primarily facilitated by intermediaries or brokers via websites and mobile apps. Uberisation refers to the rise of the sharing economy. In 2015, $26 billion in transactions were a result of the sharing economy. The sharing economy faces regulatory and political challenges, such as: defining the nature of the employment relationship between the facilitator and the service provider; designing regulations to safeguard parties to access economy transactions; taxation; and compliance with legacy regulations, such as the long-time requirement for taxi drivers to provide wheelchair vans. The sharing economy can refer to social peer-to-peer processes that include sharing of access to goods and services, or any rental transaction facilitated by a two-sided market, including business to consumer (B2C). For this reason, the term sharing economy has been criticised as misleading, as some argue that even services that enable peer-to-peer exchange can be primarily profit-driven. The sharing economy is related to the circular economy, which minimizes waste and includes co-operatives, co-creation, recycling, upcycling, re-distribution, and trading used goods. It is also closely related to collaborative consumption in which an item is consumed by multiple people. 2.5 There are sometimes uses for "waste"
In an article in Harvard Business Review, authors Giana M. Eckhardt and Fleura Bardhi argue that "sharing economy" is a misnomer, and that the correct term for this activity is access economy. The authors say, "When "sharing" is market-mediated—when a company is an intermediary between consumers who don't know each other—it is no longer sharing at all. Rather, consumers are paying to access someone else's goods or services." The article states that companies (such as Uber) that understand this, and whose marketing highlights the financial benefits to participants, are successful, while companies (such as Lyft) whose marketing highlights the social benefits of the service are less successful. This insight − that it is an access economy rather than a sharing economy – has important implications for how companies in this space compete. It implies that consumers are more interested in lower costs and convenience than they are in fostering social relationships with the company or other consumers.....The access economy is changing the structure of a variety of industries, and a new understanding of the consumer is needed to drive successful business models. A successful business model in the access economy will not be based on community, however, as a sharing orientation does not accurately depict the benefits consumers hope to receive. It is important to highlight the benefits that access provides in contrast to the disadvantages of ownership and sharing. The notion of "sharing economy" has often been considered as an oxymoron, and a misnomer for actual commercial exchanges. Arnould and Rose proposed to replace the misleading concept of "sharing" by that of mutualism or mutualization. A distinction can therefore be made between free mutualization such as genuine sharing and for-profit mutualization in the likes of Uber, Airbnb, or Taskrabbit. According to George Ritzer, this trend towards increased consumer input in commercial exchanges refers to the notion of prosumption, which, as such, is not new. The mutualization of resources is for example well known in business-to-business (B2B) like heavy machinery in agriculture and forestry as well as in business-to-consumer (B2C) like self-service laundry. But three major drivers enable consumer-to-consumer (C2C) mutualization of resources for a broad variety of new goods and services as well as new industries. First, customer behaviour for many goods and services changes from ownership to sharing. Second, online social networks and electronic markets more easily link consumers. And third, mobile devices and electronic services make the use of shared goods and services more convenient. For example, smartphone key entry technology makes sharing an apartment easier compared to using physical keys. The escrow-like model practiced by several of the largest sharing economy platforms, which facilitate and handle contracting and payments on behalf of their subscribers, further underlines an emphasis on access and transaction rather than on sharing. A "sharing economy," by definition, is lateral in structure. It is a peer-to-peer economy. But Uber, as its name suggests, is hierarchical in structure. It monitors and controls its drivers, demanding that they purchase services from it while guiding their movements and determining their level of earnings. And its pricing mechanisms impose unpredictable costs on its customers, extracting greater amounts whenever the data suggests customers can be compelled to pay them. This is a top-down economy, not a "shared" one. While some successful platforms such as Airbnb or CanYa involve the sharing of a resource, the term sharing economy has been widely criticised as being misleading. Commercial implementations encompass a wide range of structures including mostly for-profit, and, to a lesser extent, co-operative structures. The sharing economy provides expanded access to products, services and talent beyond one-to-one or singular ownership, which is sometimes referred to as "disownership". Individuals actively participate as users, providers, lenders or borrowers in varied and evolving peer-to-peer exchange schemes. The third thing that the Internet did was social. It created a generation of people who began doing something that cut to the heart of the way society has been organized for several hundred years. These people—mainly young—began preferring access to ownership. Instead of planning their lives on the premise of acquiring and owning more private property, this new generation began finding meaning and satisfaction in having access to things and interacting with other people in the process. A common premise is that when information about goods is shared (typically via an online marketplace), the value of those goods may increase for the business, for individuals, for the community and for society in general. Many state, local and federal governments are engaged in open data initiatives and projects such as data.gov and the London Data Store. The theory of open or "transparent" access to information enables greater innovation, and makes for more efficient use of products and services, and thus supporting resilient communities. In many cases, the sharing economy relies on the will of the users to share, but in order to make an exchange, users have to overcome stranger danger. Access economy organizations say they are committed to building and validating trusted relationships between members of their community, including producers, suppliers, customers or participants. Beyond trusting others (i.e., the peers), the users of a sharing economy platform also have to trust the platform itself as well as the product at hand. Unused value refers to the time over which products, services and talents lay idle. This idle time is wasted value that business models and organizations that are based on sharing can potentially utilize. The classic example is that the average car is unused 92% of the time. This wasted value can be a significant resource, and hence an opportunity, for sharing economy car solutions. There is also significant unused value in "wasted time", as articulated by Clay Shirky in his analysis of power of "crowds" connected by information technology. Many people have unused capacity in the course of their day. With social media and information technology, such people can donate small slivers of time to take care of simple tasks that others need doing. Examples of these crowdsourcing solutions include the for-profit Amazon Mechanical Turk and the non-profit Ushahidi. There are sometimes uses for "waste"
Waste is commonly considered as something that is no longer wanted and needs to be discarded. The challenge with this point of view is that much of what we define as waste still has value that, with proper design and distribution, can safely serve as "nutrients" for follow-on processes, unlocking new levels of value in increasingly scarce and expensive resources. One example is "heirloom design" as articulated by physicist and inventor Saul Griffith. Technological: The growth of e-commerce transformed consumers' relationship to the procurement of goods and services. Enabling technologies have made it easy for large networks of people and organizations to transact directly. These include; open data, the ubiquity and low-cost of mobile phones, and social media. Social commerce is the notion that commerce is facilitated by social networking. People are more likely to buy products because of the "social influence exerted by peers on purchasing decisions". The involvement of social media encourages and promotes the sharing economy and social commerce because it not only encourages people buy similar products and try similar things, but it also encourages people to look for group deals such as those proliferated by companies like Groupon. Economic: The Great Recession saw a decline of stable personal income as well reduction of "surplus" Disposable and discretionary income and purchasing power. Rising prosperity across the developing world coupled with population growth is putting greater strain on natural resources and has caused a spike in costs and market volatility. This has been increasing pressure on traditional manufacturers to seek design, production and distribution alternatives that will stabilize costs and smooth projected expenditures. In this context, the circular economy approach has been gaining interest among many global corporate actors. While a handful of pioneering companies are leading the way, wider adoption will rely on mesh economy skills such as the collection and sharing of data, the spread of best practices, and increased collaboration. An example of this could be taken from an interview by Arun Sundararajan with Ola CEO Bhavish Aggarwal suggesting that India’s rising middle class might ‘leap-frog’ car ownership all together and shift to ride-sharing given car ownerships large inefficiencies in the United States. Consumers look for cost-reduction solutions within the sharing economy. Communities and companies can reduce the costs of acquiring resources through sharing those resources with other whilst they are in use. In Tomorrow 3.0, author Michael Munger discussed reducing transaction costs by splitting costs. allows Certain companies allow people to use the same resources but split the fixed costs of doing so by sharing them. Unlike Uber or Airbnb, this type of collaborative consumption reduces the amount of excess capacity in the economy without commoditising the assets that it relies on. Political: macroeconomic austerity and an increased viability of complementary currency mechanisms. Social: personal Economic materialism as a central pillar of optimal lifestyle choices began to be questioned in favor of Postmaterialism. The trend towards urban lifestyles: The congested urban setting creates a new series of problems that can be addressed by the sharing economy. "Unlike earlier generations of information or technology-based enterprises, sharing enterprises rely on a critical mass of providers and consumers who are sufficiently close to each other or to other amenities to make their platforms work, often finding value in the very fact of the beneficial spillovers from proximity." Like taxi services, a transportation network company (TNC) takes people who live in one common area and transports them to another area. However, to make the initial pick up the driver must be relatively close to the passenger. Urban settings inherently force people to live and work in close proximity. This means that the number of people going to and from similar destinations is going to increase. TNCs realized this and created a business format to take advantage of this new urban setting. In urban settings where there is limited space for housing, people are always hard pressed to find cheaper housing and rental options when moving from city to city. Airbnb realized this and was able to take advantage of people who had space they aren’t using and rent it out at cheaper costs to the people who need a place to stay for shorter amounts of time. The business model of companies situated in the gig economy has been criticised for using technology to evade worker protections such as rights to minimum wages and paid leave and disguising employment relationships as independent contracting/self employment in order to shift costs onto workers. For example, a study by the Centre for Future Work at the Australia Institute accused Uber of "creatively leveraging the advantages of its dispatch system in order to evade traditional labour regulations (and other inconvenient taxes and regulations)." While in traditional industries, workers may enjoy the benefits of trade unions, healthcare provision, minimum wage, contract termination and working hours rights, employees within the sharing economy are often paid as freelancers. Freelancers do not receive pension benefits or other employee rights and benefits and are often not paid on an hourly basis. A 2016 study by the McKinsey Global Institute concluded that, across America and England, there were a total of 162 million people that were involved in some type of independent work. Moreover, their payment is linked to the gigs they perform, which could be deliveries, rentals or other services. In some jurisdictions, legal rulings have classified full-time freelancers working for a single main employer of the gig economy as workers and awarded them regular worker rights and protection. An example is the October 2016 ruling against Uber in the case of Uber BV v Aslam, which supported the claim of two Uber drivers to be classified as workers and to receive the related worker rights and benefits. It is important to distinguish employment in the sharing economy from employment through zero-hour contracts, a term primarily used in the United Kingdom. Employment in the gig economy entails receiving compensation for one key performance indicator, which, for example, is defined as parcels delivered or taxi lifts conducted. Another feature is that employees can opt to refuse taking an order. Although employers do not have to guarantee employment or employees can also refuse to take an order under a zero-hour contract, workers under such a contract are paid by the hour and not directly through business-related indicators as in the case of the gig economy. One inspiration for the sharing economy was the tragedy of the commons, which refers to the idea that when we all act solely in our self-interest, we deplete the shared resources we need for our own quality of life. The Harvard law professor Yochai Benkler, one of the earliest proponents of open source software, posited that network technology could mitigate this issue through what he called 'commons-based peer production', a concept first articulated in 2002. Benkler then extended that analysis to "shareable goods" in Sharing Nicely: On Shareable goods and the emergence of sharing as a modality of economic production, written in 2004. The term "sharing economy" began to appear around the time of the Great Recession, enabling social technologies, and an increasing sense of urgency around global population growth and resource depletion. Professor Lawrence Lessig was possibly first to use the term in 2008, though others claim the origin of the term is unknown. As of 2015, according to a Pew Research Center survey, only 27% of Americans had heard of the term "sharing economy". Survey respondents who had heard of the term had divergent views on what it meant, with many thinking it concerned "sharing" in the traditional sense of the term. Many people thought it made sense for regular consumers not to buy their own power drill-—a tool that many consumers might use for only a few minutes in their lifetime-but to borrow from others instead, and that this borrowing could be facilitated by online platforms. Several startups were launched to help people share drills and similar goods along these lines. However, it was clear that consumers were not interested in such temporary exchanges, leading to the failure of many startups which aimed to facilitate traditional sharing. The term "collaborative consumption" was coined by Marcus Felson and Joe L. Spaeth in their paper "Community Structure and Collaborative Consumption: A routine activity approach" published in 1978 in the American Behavioral Scientist. In 2011, collaborative consumption was named one of TIME magazine's 10 ideas that will change the world. A June 2018 study, using bibliometrics and network analysis, analyzed the evolution of scholarly research on collaborative consumption, and identified that this expression started in 2010 with Botsman and Rogers' (2010) book "What's mine is yours: The rise of collaborative consumption". The number of studies published on the subject then increased exponentially in 2014. Furthermore, there are four clusters of research: 1) exploration and conceptualization of collaborative consumption; 2) consumer behavior and marketing empiricism; 3) mutualization and sharing systems; 4) sustainability in the collaborative economy. The analysis suggests that this last cluster was under-researched in contrast to the three others, but has started to increase in importance since 2017.
in its 2015 Budget, the UK Government set out objectives to improve economic growth including to make Britain the "...best place in the world to start, invest in, and grow a business, including through a package of measures to help unlock the potential of the sharing economy..."
Also in 2015, The Business of Sharing by Alex Stephany, CEO of JustPark, was published by Palgrave Macmillan. The book features interviews with high-profile entrepreneurs such as Martin Varsavsky and venture capitalists such as Fred Wilson. According to a report by the United States Department of Commerce in June 2016, quantitative research on size and growth of the sharing economy remains sparse. Growth estimates can be challenging to evaluate due to different and sometimes unspecified definitions about what sort of activity counts as sharing economy transactions. The report noted a 2014 study by PricewaterhouseCoopers, which looked at five components of the sharing economy: travel, car sharing, finance, staffing and streaming. It found that global spending in these sectors totalled about $15 billion in 2014, which was only about 5% of the total spending in those areas. The report also forecasted a possible increase of "sharing economy" spending in these areas to $335 billion by 2025, which would be about 50% of the total spending in these five areas. A 2015 PricewaterhouseCoopers study found that nearly one-fifth of American consumers partake in some type of sharing economy activity. A 2017 report by Diana Farrell and Fiona Greig suggested that at least in the US, sharing economy growth may have peaked. A December 2017 study ordered by the European Commission indicated that the volume of P2P transactions in the EU across five sectors: sales of goods, accommodation rentals, goods sharing, odd jobs and ridesharing, totaled €27.9 billion in 2015. In China, the sharing economy doubled in 2016, reaching 3.45 trillion yuan ($500 billion) in transaction volume, and was expected to grow by 40% per year on average over the next few years, according to the country’s State Information Center. In 2017, an estimated 700 million people used sharing economy platforms. According to TIARCENTER and the Russian Association of Electronic Communications, eight key verticals of Russia’s sharing economy (C2C sales, odd jobs, car sharing, carpooling, accommodation rentals, shared offices, crowdfunding and goods sharing) grew 30% to 511 billion rubles ($7.8 billion) in 2018. Collaborative consumption as a phenomenon is a class of economic arrangements in which participants mutualize access to products or services, in addition to finding original ways to individual ownership. The phenomenon stems from consumers' increasing desire to be in control of their consumption instead of "passive 'victims' of hyperconsumption". 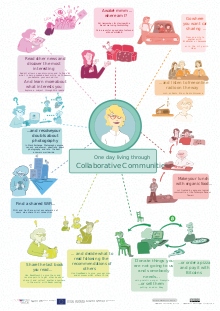 The collaborative consumption model is used in online marketplaces such as eBay as well as emerging sectors such as social lending, peer-to-peer accommodation, peer-to-peer travel experiences, peer-to-peer task assignments or travel advising, and carsharing or commuting-bus sharing. Collaborative consumption refers to resource circulation systems which allow a consumer two-sided role, in which consumers may act as both providers of resources or obtainers of resources. The exchange may be performed directly on a peer-to-peer basis, or indirectly through an intermediary; online or offline; for free or for other compensation (ex. money, points, services, etc.). This vision allows for a broader understanding of the sharing economy based on the overarching criteria of consumers' changing role capacity. Originally, in 2010, Botsman and Rogers identified three resource circulation systems within collaborative consumption, i.e. the sharing economy: product service systems, redistribution markets and collaborative lifestyles. Product-service systems refer to commercial peer-to-peer mutualization systems (CPMS), allowing consumers to engage in monetized exchanges through Social peer-to-peer processes for temporary access to goods. Goods that are privately owned can be shared or rented out via peer-to-peer marketplaces. For example, BMW's "DriveNow", established in 2011, is a car rental service that offers an alternative to owning a car. Users can access a car when and where they need one and pay for their usage by the minute. A system of collaborative consumption is based on used or pre-owned goods being passed on from someone who does not want them to someone who does want them. This is another alternative to the more common 'reduce, reuse, recycle, repair' methods of dealing with waste. In some markets, the goods may be free, as on The Freecycle Network, Zwaggle, or Kashless.org. In others, the goods are swapped (as on Swap.com) or sold for cash (as on eBay, craigslist, and uSell). Collaborative lifestyles refer to community-based platforms, allowing consumers to engage in monetized exchanges through Social peer-to-peer processes for services or access to resources such as money or skills. These systems are based on people with similar needs or interests banding together to mutualize and exchange less-tangible assets such as time, space, skills, and money. The growth of mobile technology provides a platform to enable location-based GPS technology and to also provide real-time sharing. Encompassing many of the listed benefits of the sharing economy is the idea of the freelance worker. Through monetizing unused assets, such as renting out a spare guest room on Airbnb, or providing personal services to others, such as becoming a driver with Uber, people are in effect becoming freelance workers. Freelance work entails better opportunity for employment, as well as more flexibility for workers, as people have the ability to pick and choose the time and place of their work. As freelance workers, people can plan around their existing schedules and maintain multiple jobs if needed. Evidence of the appeal to this type of work can be seen from a survey conducted by the Freelancers Union, which shows that around 34% of the U.S. population is involved in freelance work. According to an article by Margarita Hakobyan, freelance work can also be beneficial for small businesses. During their early developmental stages, many small companies can’t afford or aren’t in need of full-time departments, but rather require specialized work for a certain project or for a short period of time. With freelance workers offering their services in the sharing economy, firms are able to save money on long-term labor costs, and increase marginal revenue from their operations. Researcher Christopher Koopman, an author of a[which?] study by George Mason University economists, said the sharing economy "allows people to take idle capital and turn them into revenue sources." He has stated, "People are taking spare bedroom[s], cars, tools they are not using and becoming their own entrepreneurs." Arun Sundararajan, a New York University economist who studies the sharing economy, told a congressional hearing that "this transition will have a positive impact on economic growth and welfare, by stimulating new consumption, by raising productivity, and by catalyzing individual innovation and entrepreneurship". A study in Intereconomics / The Review of European Economic Policy noted that the sharing economy has the potential to bring many benefits for the economy, while noting that this presupposes that the success of sharing economy services reflects their business models rather than 'regulatory arbitrage' from avoiding the regulation that affects traditional businesses. The power bank-sharing concept works as follows: Through an app, users locate a shared-charger station, scan a QR code, pay a deposit, and borrow a power bank. The battery packs can be returned to any charging station. LeDian allowed customers to use the power banks free of charge for the first 24 hours after paying a 50-yuan ($7.60) deposit. After the first day, users were charged 2 yuan per day for the service. The company failed in 2017. An independent data study conducted by Busbud in 2016 compared the average price of hotel rooms with the average price of Airbnb listings in thirteen major cities in the United States. The research concluded that in nine of the thirteen cities, Airbnb rates were lower than hotel rates by an average price of $34.56. A further study conducted by Busbud compared the average hotel rate with the average Airbnb rate in eight major European cities. The research concluded that the Airbnb rates were lower than the hotel rates in six of the eight cities by a factor of $72. Data from a separate study shows that with Airbnb's entry into the market in Austin, Texas hotels were required to lower prices by 6 percent to keep up with Airbnb's lower prices. Flexible and convenient work hours: The sharing economy allows workers to set their own hours of work. An Uber driver explains, "the flexibility extends far beyond the hours you choose to work on any given week. Since you don’t have to make any sort of commitment, you can easily take time off for the big moments in your life as well, such as vacations, a wedding, the birth of a child, and more." Workers are able to accept or reject additional work based on their needs while using the commodities they already possess to make money. Low barriers to entry: Depending on their schedules and resources, workers can provide services in more than one area with different companies. This allows workers to relocate and continue earning income. Also, by working for such companies, the transaction costs associated with occupational licences are significantly lowered. For example, in New York City, taxi drivers must have a special driver's license and undergo training and background checks, while Uber contractors can offer "their services for little more than a background check." Maximum benefit for sellers and buyers: Enables users to improve living standards by eliminating the emotional, physical, and social burdens of ownership. Without the need to maintain a large inventory, deadweight loss is reduced, prices are kept low, all while remaining competitive in the markets. Environmental benefit: Access economies allow the reuse and repurpose of already existing commodities. Under this business model, private owners share the assets they already possess when not in use. Breaking of monopolies: In Zimbabwe, Airbnb, along with other businesses of this type, has led to a rise in consumer benefits stemming from good prices and quality. This model also allows for more opportunities for those that are self employed. Several academics demonstrated that in 2015, Uber generated $6.8 billion of consumer welfare in the United States. UberEATS allows users to order food and register to be UberEATS drivers. Similar to Uber drivers, UberEATS drivers get paid for delivering food. An example of grocery delivery in sharing economy is Instakart. It has the same business model as that of sharing economy based companies like Uber, Airbnb, or CanYa. Instacart uses resources that are readily available, and the shoppers shop at existing grocery shops. The contract workers use their personal vehicles to deliver groceries to customers. Instacart manages to keep its cost low as it does not require any infrastructure to store goods. In addition to having contract workers, Instacart allows signing up to be a "personal shopper" for Instacart through its official web page. Oxford Internet Institute, Economic Geographer, Graham has argued that key parts of the sharing economy impose a new balance of power onto workers. By bringing together workers in low- and high-income countries, gig economy platforms that are not geographically-confined can bring about a 'race to the bottom' for workers. New York Magazine wrote that the sharing economy has succeeded in large part because the real economy has been struggling. Specifically, in the magazine's view, the sharing economy succeeds because of a depressed labor market, in which "lots of people are trying to fill holes in their income by monetizing their stuff and their labor in creative ways", and in many cases, people join the sharing economy because they've recently lost a full-time job, including a few cases where the pricing structure of the sharing economy may have made their old jobs less profitable (e.g. full-time taxi drivers who may have switched to Lyft or Uber). The magazine writes that "In almost every case, what compels people to open up their homes and cars to complete strangers is money, not trust. ... Tools that help people trust in the kindness of strangers might be pushing hesitant sharing-economy participants over the threshold to adoption. But what's getting them to the threshold in the first place is a damaged economy, and harmful public policy that has forced millions of people to look to odd jobs for sustenance." Uber's "audacious plan to replace human drivers" may increase job loss as even freelance driving will be replaced by automation. However, in a report published in January 2017, Carl Benedikt Frey found that while the introduction of Uber had not led to jobs being lost, but had caused a reduction in the incomes of incumbent taxi drivers of almost 10%. Frey found that the "sharing economy", and Uber in particular, has had substantial negative impacts on workers wages. Some people believe the Great Recession led to the expansion of the shared economy because job losses enhanced the desire for temporary work, which is prevalent in the sharing economy. However, there are disadvantages to the worker; when companies use contract based employment, the "advantage for a business of using such non-regular workers is obvious: It can lower labor costs dramatically, often by 30 percent, since it is not responsible for health benefits, social security, unemployment or injured workers' compensation, paid sick or vacation leave and more. Contract workers, who are barred from forming unions and have no grievance procedure, can be dismissed without notice". There is debate over the status of the workers within the sharing economy; whether they should be treated as independent contractors or employees of the companies. This issue seems to be most relevant among sharing economy companies such as Uber. The reason this has become such a big issue is that the two types of workers are treated very differently. Contract workers are not guaranteed any benefits and pay can be below average. However, if they are employees, they are granted access to benefits and pay is generally higher. The California Public Utilities Commission filed a case, later settled out of court, that "addresses the same underlying issue seen in the contract worker controversy—whether the new ways of operating in the sharing economy model should be subject to the same regulations governing traditional businesses". Like Uber, Instakart too had to face similar lawsuits. In 2015, a lawsuit was filed against Instakart alleging the company misclassified a person who buys and delivers groceries as independent contractor. Instakart had to eventually make all such people as part-time employees and had to accord benefits such as health insurance to those qualifying. This led to Instakart having thousands of employees overnight from zero. A 2015 article by economists at George Mason University argued that many of the regulations circumvented by sharing economy businesses are exclusive privileges lobbied for by interest groups. Workers and entrepreneurs not connected to the interest groups engaging in this rent-seeking behavior are thus restricted from entry into the market. For example, taxi unions lobbying a city government to restrict the number of cabs allowed on the road prevents larger numbers of drivers from entering in the marketplace. The same research finds that while access economy workers do lack the protections that exist in the traditional economy, many of them cannot actually find work in the traditional economy. In this sense, they are taking advantage of opportunities which the traditional regulatory framework has not been able to provide for them. As the sharing economy grows, governments at all levels are reevaluating how to adjust their regulatory schemes to accommodate these workers. Andrew Leonard, Evgeny Morozov, Bernard Marszalek, Dean Baker, and Andrew Keen criticized the for-profit sector of the sharing economy, writing that sharing economy businesses "extract" profits from their given sector by "successfully [making] an end run around the existing costs of doing business" - taxes, regulations, and insurance. Similarly, In the context of online freelancing marketplaces, there have been worries that the sharing economy could result in a 'race to the bottom' in terms or wages and benefits: as millions of new workers from low-income countries come online. Susie Cagle wrote that the benefits big sharing economy players might be making for themselves are "not exactly" trickling down, and that the sharing economy "doesn't build trust" because where it builds new connections, it often "replicates old patterns of privileged access for some, and denial for others". William Alden wrote that "The so-called sharing economy is supposed to offer a new kind of capitalism, one where regular folks, enabled by efficient online platforms, can turn their fallow assets into cash machines ... But the reality is that these markets also tend to attract a class of well-heeled professional operators, who outperform the amateurs—just like the rest of the economy". The local economic benefit of the sharing economy is offset by its current form, which is that huge tech companies reap a great deal of the profit in many cases. For example, Uber, which is estimated to be worth $50B as of mid-2015, takes up to 30% commission from the gross revenue of its drivers, leaving many drivers making less than minimum wage. This is reminiscent of a peak Rentier state "which derives all or a substantial portion of its national revenues from the rent of indigenous resources to external clients". Companies such as Airbnb and Uber do not share their reputation data with the very users to whom it belongs. No matter how well people behave on any one platform, their reputation doesn't transfer to other platforms. This fragmentation has some negative consequences, such as the Airbnb squatters who had previously deceived Kickstarter users to the tune of $40,000. Sharing data between these platforms could have prevented the repeat incident. Business Insider's view is that since the sharing economy is in its infancy, this has been accepted. However, as the industry matures, this will need to change. Giana Eckhardt and Fleura Bardhi say that the access economy promotes and prioritizes cheap fares and low costs rather than personal relationships, which is tied to similar issues in crowdsourcing. For example, consumers reap similar benefits from Zipcar as they would from a hotel. In this example, the primary concern is the low cost. Because of this, the "sharing economy" may not be about sharing but rather about access. Giana Eckhardt and Fleura Bardhi say the "sharing" economy has taught people to prioritize cheap and easy access over interpersonal communication, and the value of going the extra mile for those interactions has diminished. Concentration of power can lead to unethical business practices. By using software named 'Greyball', Uber was able to make it difficult for regulatory officials to use the application. Another schemes allegedly implemented by Uber includes using its application to show 'phantom' cars nearby to consumers on the app, implying shorter pick-up times than could actually be expected. Uber denied the allegation. Regulations that cover traditional taxi companies but not transportation network companies can put taxis at a competitive disadvantage. Uber has faced criticism from taxi drivers worldwide due to the increased competition. Uber has also been banned from several jurisdictions due to failure to comply with licensing laws. An umbrella sharing service named Sharing E Umbrella was started in 11 cities across China in 2017 lost almost all of the 300,000 umbrellas placed out for sharing purposes during the first few weeks. Quality discrepancies: Since access economy companies rely on independent workers, the quality of service can differ between various individual providers on the same platform. In 2015, Steven Hill from the New America Foundation cited his experience signing up to become a host on Airbnb as simple as uploading a few photos to the website "and within 15 minutes my place was “live” as an Airbnb rental. No background check, no verifying my ID, no confirming my personal details, no questions asked. Not even any contact with a real human from their trust and safety team. Nothing.". However, due to the reputation model, customers are provided with a peer-reviewed rating of the provider and are given a choice of whether to proceed with the transaction. Inadequate liability guarantees: Though some companies offer liability guarantees such as Airbnb's "Host Guarantee" that promises to pay up to 1 million in damages, it is extremely difficult to prove fault. Ownership and usage: The access economy blurs the difference between ownership and usage, which allows for the abuse or neglect of items absent policies. Replacement of small local companies with large international tech companies. For example, taxi companies tend to be locally-owned and operated, while Uber is California-based. Therefore, taxi company profits tend to stay local, while some portion of access economy profits flow out of the local community. The impacts of the access economy in terms of costs, wages and employment are not easily measured and appear to be growing. Various estimates indicate that 30-40% of the U.S. workforce is self-employed, part-time, temporary or freelancers. However, the exact percentage of those performing short-term tasks or projects found via technology platforms was not effectively measured as of 2015 by government sources. In the U.S., one private industry survey placed the number of "full-time independent workers" at 17.8 million in 2015, roughly the same as 2014. Another survey estimated the number of workers who do at least some freelance work at 53.7 million in 2015, roughly 34% of the workforce and up slightly from 2014. Economists Lawrence F. Katz and Alan B. Krueger wrote in March 2016 that there is a trend towards more workers in alternative (part-time or contract) work arrangements rather than full-time; the percentage of workers in such arrangements rose from 10.1% in 2005 to 15.8% in late 2015. Katz and Krueger defined alternative work arrangements as "temporary help agency workers, on-call workers, contract company workers, and independent contractors or free-lancers". They also estimated that approximately 0.5% of all workers identify customers through an online intermediary; this was consistent with two others studies that estimated the amount at 0.4% and 0.6%. At the individual transaction level, the removal of a higher overhead business intermediary (say a taxi company) with a lower cost technology platform helps reduce the cost of the transaction for the customer while also providing an opportunity for additional suppliers to compete for the business, further reducing costs. Consumers can then spend more on other goods and services, stimulating demand and production in other parts of the economy. Classical economics argues that innovation that lowers the cost of goods and services represents a net economic benefit overall. However, like many new technologies and business innovations, this trend is disruptive to existing business models and presents challenges for governments and regulators. For example, should the companies providing the technology platform be liable for the actions of the suppliers in their network? Should persons in their network be treated as employees, receiving benefits such as healthcare and retirement plans? If consumers tend to be higher income persons while the suppliers are lower-income persons, will the lower cost of the services (and therefore lower compensation of the suppliers) worsen income inequality? These are among the many questions the on-demand economy presents. Using a personal car to transport passengers or deliveries requires payment, or sufferance, of costs for fees deducted by the dispatching company, fuel, wear and tear, depreciation, interest, taxes, as well as adequate insurance. The driver is typically not paid for driving to an area where fares might be found in the volume necessary for high earnings, or driving to the location of a pickup or returning from a drop-off point. Mobile apps have been written that help a driver be aware of and manage such costs has been introduced. Uber, Airbnb, and other companies have had drastic effects on infrastructures such as road congestion and housing. Major cities such as San Francisco and New York City have arguably become more congested due to their use. According to transportation analyst Charles Komanoff, "Uber-caused congestion has reduced traffic speeds in downtown Manhattan by around 8 percent". The percentage of seniors in the work force has increased from 20.7% in 2009 to 23.1% in 2015, an increase in part attributed to the rise of the access economy. As a response to the fast-changing nature of working practices in the modern economy, especially temporary work, The UK Government has carried out a review and issued guidelines in an attempt to address these issues. The report was published on the 11th July 2017 and the overriding conclusion was that the UK’s economy should be “fair and decent”. A 7-point plan was suggested to improve working conditions and security. In addition, The Taylor Review outlines demands asking the distribution of power be distributed at a more equal level. It asks for workers of these, gig economy businesses be labeled as "dependent contractors with extra benefits". Other demands include, better corporate management, skill development efforts, fostering of a positive workplace, and financial representation provided by the state. ^ The Case For Collaborative Consumption. ^ Schor, Juliet (October 2014). "Debating the Sharing Economy". ^ Cartagena, Juan (December 13, 2014). "What is the right name for the "sharing-economy"?". Medium. ^ BOTSMAN, RACHEL (May 27, 2015). "Defining The Sharing Economy: What Is Collaborative Consumption–And What Isn't?". Fast Company. ^ a b Ertz, Myriam; Leblanc-Proulx, Sébastien (2018). "Sustainability in the sharing economy: A bibliometric analysis reveals emerging interest". Journal of Cleaner Production. 196: 1073–1085. doi:10.1016/j.jclepro.2018.06.095. ^ Laurell, Christofer; Sandström, Christian (2017). "The sharing economy in social media: Analyzing tensions between market and non-market logics". Technological Forecasting and Social Change. 125: 58–65. doi:10.1016/j.techfore.2017.05.038. ^ Botsman, Rachel; Rogers, Roo (2011). What's Mine Is Yours: How Collaborative Consumption is Changing the Way We Live. HarperCollins Business. ISBN 978-0-00-739591-0. ^ a b c Hamari, Juho; Sjöklint, Mimmi; Ukkonen, Antti (2016). "The Sharing Economy: Why People Participate in Collaborative Consumption". Journal of the Association for Information Science and Technology. 67 (9): 2047–2059. doi:10.1002/asi.23552. ^ Hook, Leslie (22 June 2016). "Review – 'The Sharing Economy'". Financial Times. ^ "Business Models Shaping New Mobility". WSP Global. January 4, 2018. ^ a b Ertz, Myriam; Lecompte, Agnes; Durif, Fabien (2016). "It's not my fault, I am in the right: Exploration of neutralization in the justification of the support and use of a controversial technological collaborative consumption service". Technological Forecasting & Social Change. 134: 254–264. doi:10.1016/j.techfore.2018.06.032. ^ Sundararajan, Arun (January 3, 2013). "From Zipcar to the Sharing Economy". Harvard Business Review. ^ "Taking uberization to the Field – Disruption is coming for Field Marketing" (Press release). International Data Group. 14 April 2016. ^ "The Business of Sharing Making it in the New Sharing Economy". Palgrave Macmillian. ^ "The Economist-Workers on Tap". The Economist. December 30, 2014. ^ a b Tuttle, Brad (June 30, 2014). "Can We Stop Pretending the Sharing Economy Is All About Sharing?". MONEY.com. ^ a b c Eckhardt, Giana M.; Bardhi, Fleura (January 28, 2015). "The Sharing Economy Isn't About Sharing at All". Harvard Business Review. ^ Slee, Tom (2015). What's yours is mine. OR Books. p. 216. ISBN 978-1-68219-022-7. ^ Arnould, Eric. J.; Rose, Alexander S. (2016). "Mutuality: Critique and substitute for Belk's sharing". Marketing Theory. 16 (1): 75. doi:10.1177/1470593115572669. ^ a b c Ertz, Myriam; Durif, Fabien; Arcand, Manon (2016). "Collaborative consumption: Conceptual snapshot at a buzzword". Journal of Entrepreneurship Education. 19 (9): 1–23. ^ Ertz, Myriam; Durif, Fabien; Arcand, Manon (2016). "Collaborative consumption or the rise of the two-sided consumer". International Journal of Business and Management. 6 (6). SSRN 2799886. ^ Laurell, Christofer; Sandström, Christian (June 2016). "Analysing Uber in social media – disruptive technology or institutional disruption?". International Journal of Innovation Management. 20 (5): 1640013. doi:10.1142/S1363919616400132. ^ Ritzer, George (2014). "Prosumption: Evolution, revolution, or eternal return of the same?". Journal of Consumer Culture. 14 (1). ^ Ertz, Myriam (2015). Du Web 2.0 a la seconde vie des objets: Le role de la technologie internet (in French). GRIN Verlag. p. 52. ISBN 978-3-668-04210-0. ^ "The PerfectKLIK Way". PerfectKLIK. 2017-07-21. ^ Bauwens, Michael (February 1, 2015). "The sharing economy is a lie: Uber, Ayn Rand and the truth about tech and libertarians". Salon. ^ Kessler, Sarah (October 14, 2015). "The "Sharing Economy" Is Dead, And We Killed It". Fast Company. ^ O'Connor, Sarah (June 14, 2016). "The gig economy is neither 'sharing' nor 'collaborative'". Financial Times. ^ Rosenberg, Tina (June 5, 2013). "It's Not Just Nice to Share, It's the Future". The New York Times. ^ GRANT, REBECCA (April 3, 2013). "Disownership is the new normal: the rise of the shared economy (infographic)". VentureBeat. ^ "The Collaborative Economy". Altimeter Group. June 4, 2013. ^ "The Access Economy". triplepundit.com. ^ Denning, Steve (May 2, 2014). "Three Strategies For Managing The Economy Of Access". Forbes. ^ Geron, Tomio (November 9, 2012). "Airbnb Had $56 Million Impact On San Francisco: Study". Forbes. ^ Mazmanian, Adam (May 22, 2013). "Can open data change the culture of government?". Federal Computer Week. ^ Ross, Eleanor (August 18, 2015). "How open data can help save lives". The Guardian. ^ Charles, Green (May 2, 2012). "Trusted and Being Trusted in the Sharing Economy". Forbes. ^ Hawlitschek, Florian; Teubner, Timm; Weinhardt, Christof (2016). "Trust in the Sharing Economy". Swiss Journal of Business Research and Practice. 70 (1): 26–44. doi:10.5771/0042-059X-2016-1-26. ^ MORRIS, DAVID Z. (March 13, 2016). "Today's Cars Are Parked 95% of the Time". Fortune. ^ Boudreau, Kevin; Lakhani, Karim R. (April 2013). "Using the Crowd as an Innovation Partner". Harvard Business Review. ^ Bloyd-Peshkin, Sharon (October 21, 2009). "Built to Trash". In These Times. ^ Griffith, Saul. "Everyday Inventions". TED. ^ Ertz, Myriam; Durif, Fabien; Arcand, Manon (2016). "An analysis of the origins of collaborative consumption and its implications for marketing". Academy of Marketing Studies Journal. SSRN 2799862. ^ Frey, Alexander; Trenz, Manuel; Veit, Daniel (2017). "The Role of Technology for Service Innovation in Sharing Economy Organizations – a Service-Dominant Logic Perspective". Proceedings of the 25th European Conference on Information Systems (ECIS): 1885–1901 – via AISeL. ^ "Open Data Handbook". Open Knowledge Foundation. ^ Parr, Ben (August 3, 2009). "What the F**k is Social Media?". Mashable. ^ a b Hamari, Juho; Sjöklint, Mimmi; Ukkonen, Antti (September 2016). "The sharing economy: Why people participate in collaborative consumption." Journal of the Association for Information Science and Technology". ^ Wang, C., & Zhang, P. (2012). The evolution of social commerce: The people, management, technology, and information dimensions. Communications of the Association for Information Systems, 31(1), 105–127. ^ "Sharing brings major benefits to new mobility". WSP Global. January 2018. ^ Sundararajan, Arun (2016). The Sharing Economy: The End of Employment and the Rise of Crowd-Based Capitalism. MIT Press. p. 116. ^ Munger, Michael C. (2018-03-07). Tomorrow 3.0. Cambridge University Press. doi:10.1017/9781108602341. ISBN 9781108602341. ^ Davidson, Nestor M. and John J. Infranca. "The Sharing Economy as an Urban Phenomenon." Yale Law & Policy Review, vol. 34, no. 2, Spring2016, pp. 215-279. EBSCOhost, http://search.ebscohost.com/login.aspx?direct=true&db=a9h&AN=118436221&site=eds-live. ^ Jim Stanford, Subsidising Billionaires: Simulating the Net Incomes of UberX Drivers in Australia, Australia Institute, 2018 <http://www.tai.org.au/sites/default/files/Subsidizing_Billionaires_Final.pdf>. ^ "Independent work: Choice, necessity, and the gig economy". McKinsey & Company. ^ Wilson, Bill (February 10, 2017). "What is the 'gig' economy?". BBC News. ^ Gingell, Matt. "Gig economy: How workers' rights may be about to change". ^ "Distinguishing employment under zero-hour contracts and the gig economy". ^ Benkler, Yochai (2002). "Coase's Penguin, or, Linux and The Nature of the Firm". The Yale Law Journal. 112. ^ Benkler, Yochai (2004). "Sharing Nicely: On Shareable goods and the emergence of sharing as a modality of economic production". The Yale Law Journal. 114. ^ a b Stephany, Alex (2015). The Business of Sharing: Making it in the New Sharing Economy. Palgrave Macmillan. ISBN 978-1137376176. ^ "Homestay is the origin of Sharing Economy" (Press release). PR Newswire. March 11, 2014. ^ a b Kenneth Olmstead and Aaron Smith (20 May 2016). "How Americans define the sharing economy". Pew Research Center. ^ "Economic Explanation: From Sharecropping to the Sharing Economy". 2016. ^ "What makes Uber and Airbnb flourish while others fail in 'sharing economy'?". April 7, 2016. ^ Felson, Marcus and Joe L. Spaeth (1978), "Community Structure and Collaborative Consumption: A routine activity approach," American Behavioral Scientist, 21 (March–April), 614–24. ^ "10 Ideas That Will Change The World". Time. March 17, 2011. ^ "Support for the sharing economy" (PDF). H. M. Treasury, Budget 2015, section 1.193. ^ "Review: The Business Of Sharing". May 5, 2015. ^ Cusumano, Michael A. (January 2018). "The Sharing Economy Meets Reality". Communications of the ACM. ^ Juliet Schor (17 May 2018). "The platform economy". University of California, Berkeley. ^ "Exploratory Study of consumer issues in peer-to-peer platform markets". European Commission. June 12, 2017. ^ "China's "sharing economy" up 103 pct in 2016: report". Xinhua News Agency. May 3, 2017. ^ Wang, Iris (November 7, 2018). "A glimpse at China's burgeoning sharing economy". Shareable. ^ "Sharing economy in Russia 2018" (PDF). TIARCENTER. November 22, 2018. ^ a b c Ertz, Myriam; Durif, Fabien; Arcand, Manon (2018). "A conceptual perspective on collaborative consumption". Academy of Marketing Science Review. doi:10.1007/s13162-018-0121-3. ^ a b Botsman, Rachel; Rogers, Roo (2011). What's mine is yours : how collaborative consumption is changing the way we live (Rev. and updated ed.). London: Collins. p. 51. ISBN 978-0-00-739591-0. ^ "From homes to meals to cars, 'sharing' has changed the face of travel". Chicago Tribune. December 16, 2015. ^ Botsman, Rachel; Rogers, Roo (October 2010). "Beyond Zipcar: Collaborative Consumption". Harvard Business Review. ^ Boeriu, Horatiu (March 21, 2011). "DriveNow: BMW and Sixt Joint Venture for premium car sharing". BMW. ^ Owyang, Jeremiah (24 February 2015). "The mobile technology stack for the Collaborative Economy". VentureBeat. ^ Brady, Diane (24 September 2014). "The Environmental Case for the Sharing Economy". Bloomberg News. ^ a b c Rudenko, Anna (16 August 2013). "The collaborative consumption on the rise: why shared economy is winning over the "capitalism of me"". ^ a b Parsons, Adam (5 March 2014). "The sharing economy: a short introduction to its political evolution". openDemocracy. ^ Bradshaw, Della (22 April 2015). "Sharing economy benefits lower income groups". Financial Times. ^ Williams-Grut, Oscar (20 March 2015). "Silicon Round-up: Blockchain banking to be on the slate for new regulator?". Evening Standard. ^ Jerome, Joseph (June 8, 2015). "User Reputation: Building Trust and Addressing Privacy Issues in the Sharing Economy". Future of Privacy Forum. ^ Geron, Tomio (January 23, 2013). "Airbnb And The Unstoppable Rise Of The Share Economy". Forbes. ^ Wallsten, Scott (June 1, 2017). "The Competitive Effects of the Sharing Economy: How is Uber Changing Taxis?". Technology Policy Institute. ^ Kumar, S. (July 20, 2015). "3 reasons to cheer Uber and the sharing economy". Fortune. ^ Hakobyan, Margarita (February 22, 2017). "The Sharing Economy Benefits Business". Business.com. ^ a b "'Sharing economy' reshapes markets, as complaints rise". The Star. AFP. February 9, 2015. ^ Na, Chen (October 12, 2017). "Shared-Charger Startup Pulls Plug". Sixth Tone. ^ a b "Comparing Airbnb and Hotel Rates Around the Globe". Busbud. February 18, 2016. ^ Johnson, Holly. "How to Make Money Driving for Uber". The Simple Dollar. ^ "How to become a New York Taxi Driver". ^ Given, Casey (January 11, 2015). "Uber Economics: How Markets are Changing in the Sharing Economy". Atlas Network. ^ Lombardo, Crystal (October 29, 2015). "Pros and Cons of Sharing Economy". Vision Launch. ^ Cowen, Tyler (September 8, 2016). "Computing the Social Value of Uber. (It's High.)". Bloomberg News. ^ "Driving for UberEats: What it's like delivering food for Uber". 29 March 2016. ^ Manjoo, Farhad (May 21, 2014). "Grocery Deliveries in Sharing Economy". The New York Times. ^ O'Brien, Sara Ashley (2015-06-22). "The Uber effect: Instacart shifts away from contract workers". CNN. ^ Manjoo, Farhad (April 29, 2015). "Instacart's Bet on Online Grocery Shopping". The New York Times. ISSN 0362-4331. ^ Graham, Mark (May 25, 2016). "Digital work marketplaces impose a new balance of power". New Internationalist. ^ Roose, Kevin (April 24, 2014). "The Sharing Economy Isn't About Trust, It's About Desperation". New York Magazine. ^ Roose, Kevin (September 18, 2014). "Does Silicon Valley Have a Contract-Worker Problem?". New York Magazine. ^ Benner, Katie (October 2, 2014). "A Secret of Uber's Success: Struggling Workers". Bloomberg News. ^ "Uber's audacious plan to replace human drivers". CBS News. ^ Frey, Carl Benedikt (January 2017). "Drivers of Disruption? Estimating the Uber Effect". ^ a b "How the Sharing Economy Screws American Workers". The Huffington Post. January 20, 2016. ^ "Sharing Economy Companies Sharing the Heat In Contractor Controversy". Xconomy. July 17, 2015. ^ a b "Apoorva Mehta had 20 failed start-ups before Instacart". Los Angeles Times. January 27, 2017. ISSN 0458-3035. ^ a b Koopman, Christopher; Mitchell, Matthew D.; Thierer, Adam D. (May 15, 2015). "The Sharing Economy and Consumer Protection Regulation: The Case for Policy Change". The Journal of Business, Entrepreneurship & the Law. 8: 530–545. SSRN 2535345. ^ Taeihagh, Araz (19 June 2017). "Crowdsourcing, Sharing Economies, and Development". Journal of Developing Societies: 0169796X1771007. arXiv:1707.06603. doi:10.1177/0169796X17710072. ^ Leonard, Andrew (September 17, 2013). "The sharing economy muscles up". Salon.com. ^ Leonard, Andrew (2014-06-27). "Libertarians' anti-government crusade: Now there's an app for that". Salon.com. ^ Morozov, Evgeny (September 2014). "Don't believe the hype, the 'sharing economy' masks a failing economy". The Guardian. ^ MARSZALEK, BERNARD (May 26, 2014). "The New Boss – You – Just Like the Old Boss: The Sharing Economy = Brand Yourself". CounterPunch. ^ Graham, Mark (2016). "Digital work marketplaces impose a new balance of power". New Internationalist. ^ Graham, Mark (2016). "Organising in the "digital wild west": can strategic bottlenecks help prevent a race to the bottom for online workers?". Union Solidarity International. ^ "'Sharing economy' reshapes markets, as complaints rise". Bloomberg News. 2015-02-03. ^ Huet, Ellen (2015-05-18). "Uber Tests Taking Even More From Its Drivers With 30% Commission". Forbes. ^ "A Philadelphia journalist went undercover as an Uber driver — here's how much she made". MSN. 2015-05-09. ^ Isaac, Mike (March 3, 2017). "How Uber Deceives the Authorities Worldwide". The New York Times. ^ Hern, Alex (July 30, 2015). "Uber denies misleading passengers with 'phantom cars' on app". The Guardian. ^ a b c Malhotra, Arvind (November 2014). "The Dark Side of the Sharing Economy...and How to Lighten It". Communications of the ACM. 57: 24–27 – via EBSCOhost. ^ a b Rhodes, Anna (2017-04-28). "These are all the places in the world that have banned Uber". The Independent. ^ He, Huifeng (2017-07-07). "Chinese umbrella-sharing firm remains upbeat despite losing most of its 300,000 brollies". South China Morning Post. ^ Huet, Ellen (6 January 2015). "What Happens to Uber Drivers And Other Sharing Economy Workers Injured On The Job?". Forbes. ^ Hill, Steven (30 October 2015). "The two faces of Airbnb". Business Insider. ^ Bort, Julie (9 October 2014). "Airbnb Banned From Condo Complex After Guest Caused $10,000 Of Damage". Business Insider. ^ "The Gig Economy: Implications of the Growth of Contingent Work". Federalreserve.gov. ^ a b c "Gig Economy Hasn't Taken Over". Bloomberg News. August 28, 2015. ^ Hazlitt, Henry (1979). Economics in One Lesson. Three Rivers Press. ISBN 0-517-54823-2. ^ Guendelsberger, Emily (May 7, 2015). "I was an undercover Uber driver". Philadelphia City Paper. ^ Natasha Singer and Mike Isaac (May 9, 2015). "An App That Helps Drivers Earn the Most From Their Trips". The New York Times. ^ "How seniors are tapping the gig economy". ^ "The Taylor review: At-a-glance guide". BBC News. 2017-07-11. Retrieved 2018-03-02.